The name comes from the Greek word onyx which means nail of a finger or claw. Legend says that one day while Venus was sleeping Eros/Cupid cut her fingernails and left the clippings scattered on the ground. Because no part of a heavenly body can die, the gods turned them into stone which later became known as onyx. It is a member of the chalcedony family which also includes carnelian, agate, bloodstone, etc. Occuring naturally in a variety of colors, black onyx is polished to enhance appearance, a member of the quartz family. Originally, almost all colors of chalcedony from white to dark brown and black were called onyx (SiO2 with impurities). Today when we think of onyx we often preface the word with black to distinguish it from other varieties of onyx that come in white, reddish brown, brown and banded. A variety of onyx that is reddish brown with white and lighter reddish bands is known as sardonyx. Onyx is a form of chalcedony, part of the quartz group. Like the other stones in the chalcedony family, onyx has a smooth, waxy luster. Onyx can be found in a wide range of colors, often layered. 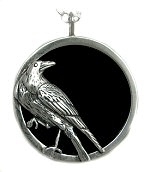 Black Onyx is often used as a backdrop in jewelry, such as cameos. It is also used as cabochons and as a building material. Black and colored onyx is always dyed. Onyz is easily dyed, so beware of the more "unnatural" looking colors, such as bright blue, etc. Onyx with red and white bands is sometimes referred to as "Sardonyx". Onyx is the black variety of agate. However some parts are more or less translucent. This is why it is often heated to accentuate the intensity of its color.